Kindly refer to the above all the three items, which were discussed together pertains to the date of effect of the MACP Scheme which was introduced by the Government on the basis of the recommendations of the 6th Central Pay Commission. The Staff Side demand to give effect to the revised promotional scheme from the date of the effect, the Report of the Commission itself i.e on 1.1.2006 was unfortunately not accepted by the official side and was not allowed to reach its logical conclusion i.e. either by an agreement or disagreement. We now send herewith copy of the judgement of the Hon’ble Supreme Court in the matter vide W.P 3744 of 2016 dated 08/12/2017. The Hon’ble apex court has categorically stated that the Govt’s decision to make the scheme effective prospectively was wrong and the scheme has to be implemented with effective from 1.1.2006 . We request that the Govt. may issue necessary orders making the MACP Scheme Effective from 1.1.2006 instead of 1.9.2008. 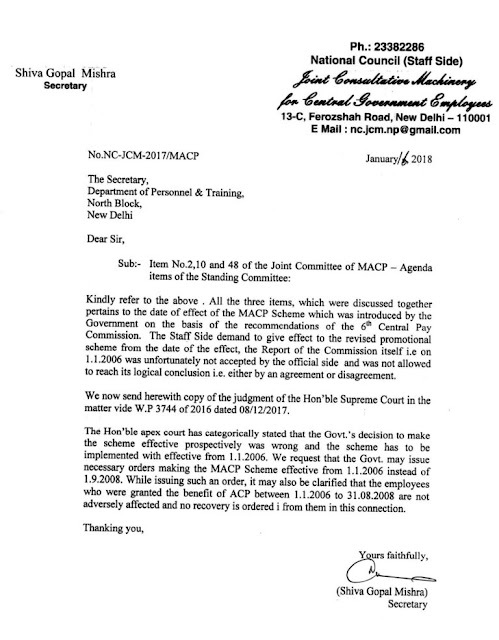 While issuing such an order it may also be clarified that the employees who were granted the benefit of ACP between 1.1.2006 to 31.08.2008 are not adversely affected and no recovery is ordered from them in this connection.